Green Belts are team leaders of the Six Sigma quality initiative projects. Green Belts require a level of knowledge and skills that enable them to successfully lead the Six Sigma project team members, under the direction of a Black Belt. The training program provides a solid foundation of Six Sigma DMAIC process improvement methodology and basic quality tools within that methodology. 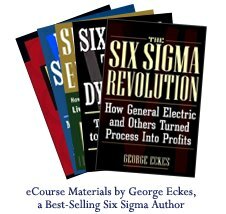 A certified instructor presents all Six Sigma eCourses in a live interactive online environment. Each of the ten eClasses is approximately 2 hours. Total eCourse duration: 20 hours online, and 40+ hours study. Price Includes: training, testing, online certification examination, study materials, shipping costs, and a certificate suitable for framing awarded to attendees who pass the Green Belt examination with a score of 70%, or more correct answers.